Founder of Harvard University John Harvard was born in near the church in Southwark. His father was a business associate of Shakespeare’s family and Shakespeare is believed to have been present when John was baptized in the church in 1607, according to Sacred Destinations. John Harvard is commemorated in the church by the Harvard Chapel, off the North Transept, restored with funds received from members of Harvard University. John was educated at Emmanuel College, Cambridge and graduated in 1635. “The following year he married Anne Sadler and having no relatives left in Southwark, decided to join his brother Puritans to form a godly commonwealth in the New World. Arriving in Boston, with his library of 320 volumes, Harvard was admitted a townsman of Charlestown and ministered in the 'First Church'. He was described as a scholar and lover of learning. He died childless in 1638. He left his books (of which only one remains) and half his fortune, £779 17s 2d, to the college of Newtown, a foundation for the 'education of English and Indian youth in knowledge and godliness'. Newtown became Cambridge, Massachusetts and the college became Harvard University according to the church website. Two panels of stained glass windows are the highlight of the chapel. The first is a window given by the then American Ambassador to London, Joseph Choate, in 1905. Depicting the baptism of Christ by John the Baptist, it is by an American artist John La Farge. It uses a technique of mixing several colors in one piece of opalescent glass. 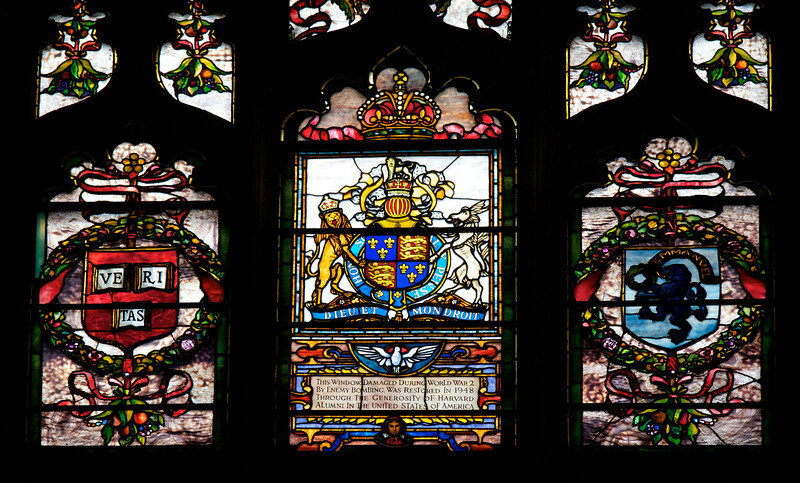 The second shows the Harvard crest (Veritas, Latin for "Verity" or "Truth") and Emmanuel College, Cambridge with an inscription “This Window, Damaged During World War 2 By Enemy Bombing, Was Restored In 1948 Through The Generosity of Harvard Alumni In The United States of America.” I don’t know the artist that created the window.